Happy New Year to the Muse community. I wish you and yours a great 2016. May all your code be bugless! An excellent short pair of articles (article 1 and article 2) from QSM discusses an analysis of 1060 software projects. The author shows that small teams consistently deliver better code for much less money than large teams. And while the bigger groups get to market faster, the difference is only a handful of percent. "A good scientist is a person with original ideas. A good engineer is a person who makes a design that works with as few original ideas as possible. There are no prima donnas in engineering." - Freeman Dyson (Alas, I have met more than a few prima donnas in this field - Jack). I wanted to note regarding learning kicad, I find Chris Gammell's videos on youtube (as well as his Contextual Electronics courses) to be excellent. I've gone from not having a clue about electronics - let alone kicad - to designing, building, writing software for PCBs. Words cannot express how grateful I am to Chris for putting this power in my hands. In the last few years, some higher end tools have been sponsored by large distributors in a stripped down version, see RS (DesignSpark), Farnell (Cadsoft Eagle), Mouser (MultiSIM Blue), and Digikey (Designer Schematic and Layout). Reviewing the list of PCB EDA tools available around, I discovered a new tool sponsored by DigiKey (at least new for me) called PCBWeb, that I have to admit it pleased me very much. First, it lets you produce your Gerber files, and save files locally. Schematics and PCB files are in XML format, without complex data bases storing everything you did after your birth. Then it produces a nice BOM with parts directly from DigiKey, with an updated board cost and the options to export it for an order. They also sponsor a few PCB makers, from which you can have an automatic quotation on your PCB cost, and optionally order fabrication (unless you don't want to do something else, since you have Gerbers). The application is quite simple to use, and for a professional maybe exposes too few options to choose from, but the feeling is good. It's even quite good at moving some already routed components on PCB, without disrupting the tracks. Libraries are on-line, and the mix of schematic parts, footprints and DigiKey codes works quite well, while new parts may need a few work, if you plan to keep in sync with DigiKey catalog. I think it's worth considering for many ones, at least for an evaluation. Then there are its cons, like when you delete a component from schematic for substitution and all of its connections get zapped (so you have to reconnect everything). The second good new of this autumn/winter season is the release of latest KiCAD, as mentioned also on EM 295. I already used the previous versions for my usual proof-of-concept scope, along with other PCB tools. However the unpolished interface never got me fond of it. I have to say that since version 4.0.0 (and 4.0.1 at the moment I write) there have been some nice updates, for a better look and usability. I strongly recommend everyone interested in PCB tools to try it, even though it's a complex tool, and takes some effort to use it. The cons about it? Well, library management has been redesigned from previous releases, but it looks organized by a team of goblins, trying to hide from you the right menus and buttons everywhere. Why not creating a clear path to a "create a new library" task? Again, maybe it's just my point of view, I'm sure someone else could find everything linear... Anyway: it's free, it works. Get it, try it! 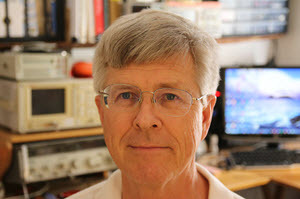 Steve Morse is the lucky winner of last month's contest; he got a LogicPort logic analyzer.. 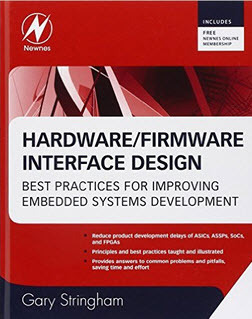 This month I'm giving away a copy of Gary Stringham's excellent Hardware/Firmware Interface Design. The contest will close at the end of January, 2016. It's just a matter of filling out your email address. As always, that will be used only for the giveaway, and nothing else. Enter via this link. Just a really quick note on quadrature encoders and debouncing. I should have written this in response to the original article, but it was the responses that really got me going. While the writers are correct that you can detect and fix stupid hardware errors in code, the first line of defense should always be to not make stupid hardware errors in the first place. Note that I say this not just as a grumpy old writer of embedded code, but also as a hardware designer and a sometime systems architect. The best time to solve this particular sort of problem (open-collector outputs over long distances) is when the decisions about mechanical and electronic hardware layouts are being made, not after problems are discovered in assembled equipment. I fully understand that for most of your readers I'm preaching to the choir: by the time such problems are discovered the situation may be such that the design is carved in stone, or it may be presented as such by management. Moreover, an individual embedded software engineer may have no control over, or even visibility into, the mechanical and electrical design of a system. For those guys, I commiserate. The audience I'm really trying to reach is the fraction of your readers who are placed highly enough in the food chain to affect the process by which such errors are spawned or avoided. The problem described should not be considered to primarily be an interesting problem in embedded software design. It should be considered as a failure in system design that is creating a potentially serious failure which is then being papered over by software. Moreover, it's a problem in system design that is very likely caused by project management paying insufficient attention to the importance of overall system design. As such, however much heroism is being displayed by coping with the problem in software, the real solution should lie with project management, product line management, and systems architects. These people should both connive on ways to fix the problem in the existing product, and to insure that the problem doesn't happen again on future projects (probably by simultaneously insuring the competence of the system design team, and giving the system designers time to do their job). Accepted wisdom is that most of the cost of software lies in its maintenance. As far back as the 70s various researches pegged it at 40-80% of the total lifecycle cost, with most of the papers leaning towards the higher numbers. Embedded code is inherently different than that living in the world of a PC. Despite 'net-based reflashing that some products support, for most firmware a software upgrade is very costly. The car must come back to the dealer, or an instrument has to be returned to a repair depot. One could argue that these costs change the nature of the code; that the expense of doing an upgrade is such that firmware engineers inherently build better code. And, of course, some products are never upgraded, like a smart toothbrush. Perhaps in the embedded world maintenance due to changing requirements is really expensed as new product development. But maybe things are changing. Philips recently sent a patch to their smart light bulbs that disabled access to competitors' products. (Yes, for a mere $60 each you, too, can outfit your house with bulbs that some teenager can hack). The company backed down after being deluged with complaints. We've all heard about the cheating software VW will have to patch. Is the future of firmware maintenance cleaning up ethical lapses? From RISKs Digest 28.91: "A great example appeared in a 1999 issue of Computing. A representative of a company with a voice recognition product prepared to demonstrate their product and asked the crowd gathered to see the demonstration to be quiet. Someone in the back of the room shouted, ``Format C Colon Return!'' Someone else shouted, ``Yes, Return!'' The software worked perfectly, reformatting the primary disk on the demonstration unit, requiring that the machine finish its format and have all of its software and data reinstalled."